Where Do I Find The Documents To Complete My Tax Return? Many feel stuck when trying to figure out how to fill out their tax return. It’s difficult to know where to start when you’re unaware of the documents required, or where exactly to locate them. That’s why we’ve detailed here the documentation you’re likely to need, so you can complete your Self Assessment online swiftly, ahead of the deadline this year. This is your Unique Taxpayer Reference. You should have received this from HMRC when you registered for the Self Assessment. Depending on your chosen method, this may have been issued via phone, online or post. If you didn’t retain it at the time, then you can find your UTR number on any previous tax returns or other documents from HMRC. If you cannot locate any of these, you can request the number from the Self Assessment helpline. HMRC also require detail on how much you earned in the tax year – even if you experienced a loss. Completing profit or loss accounts will help give you the total figure, and the information to compile this can be found in your bank statements and invoices. A dedicated business bank account will make this data collection easier, as it won’t get mixed up with any other money paid to or by you. You might need to provide specific information on your outgoings. If you spent a significant amount on allowable expenses, then these can be claimed to reduce your tax liability. However, if the total expenditure figure is below £1,000, then take advantage of the trading allowance as this doesn’t require you to keep records. If the figure is above this threshold, then you can instead provide the relevant receipts in a digital format. Documentation relating to employment may also be necessary if you were employed for any period during the given tax year. You’ll need to enter in information such as how much you earned and the amount of tax paid. The data may come from a P60 or P45 Part 1A, so make sure to keep these somewhere safe. If you received any benefits from previous employment, you may require information from your P11D. As well as information relating to employment, you may potentially need to relay other data. For example, you can find your National Insurance number on your PAYE coding notice, pay slip, P45, P60, or any letter from HMRC or the Department for Work and Pensions. Other government documentation may be necessary too, such as communications about Child Benefit or a pension. If you receive any interest from a UK bank or building society, then you might need to search your correspondence from them to complete the relevant field in your tax return. Struggling to find the right documents, or simply need help filing your self assessment this year? We know it can be difficult to keep them all in one place. 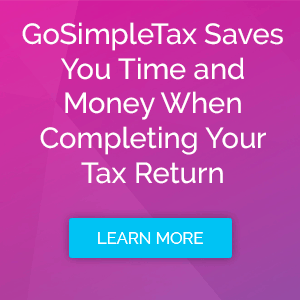 Tax return software like GoSimpleTax enables you to store them digitally so they can be easily accessed. It allows you to input your information throughout the year, before it is damaged, lost or misplaced. You can even take photos of expense receipts on the go and upload them through our app. On top of this, you can get an overview of your financial situation at any time and you’ll receive much appreciated tax-saving suggestions. With GoSimpleTax, not only will you no longer wonder how to complete the Self Assessment, you’ll also be able to minimise the amount of tax you pay. Trial our tax return software for 14 days for free, or sign up for an annual subscription so you can submit the Self Assessment as soon as possible.